You are here: Home / Jyotish Gemstones and Talismans / Stunning Iolite crystal with a lovely Blue-Violet Hue and Eye Clean clarity! Iolite-Neeli the superior alternative to Blue sapphire. Stunning Iolite crystal with a lovely Blue-Violet Hue and Eye Clean clarity! Iolite-Neeli the superior alternative to Blue sapphire. Comments Cast a look onto this beautiful Iolite from Madagascar and it draws you towards itself. Stunning eye clean clarity, no treatment, majestic Violet Blue color and near 5 carats with no treatment render this Iolite as special. 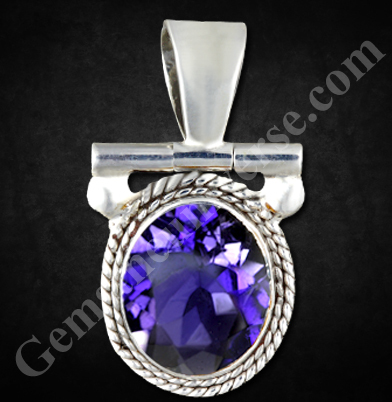 Among all Blue Sapphire alternatives Iolite and Amethyst give the best results. In fact several people say that the effects of iolite are as profound as the Blue Sapphire. The Lovely Violet Blue color offers a stunning yet subtle contrast with the sterling silver setting and the different loupe design adds to the character of the overall piece.